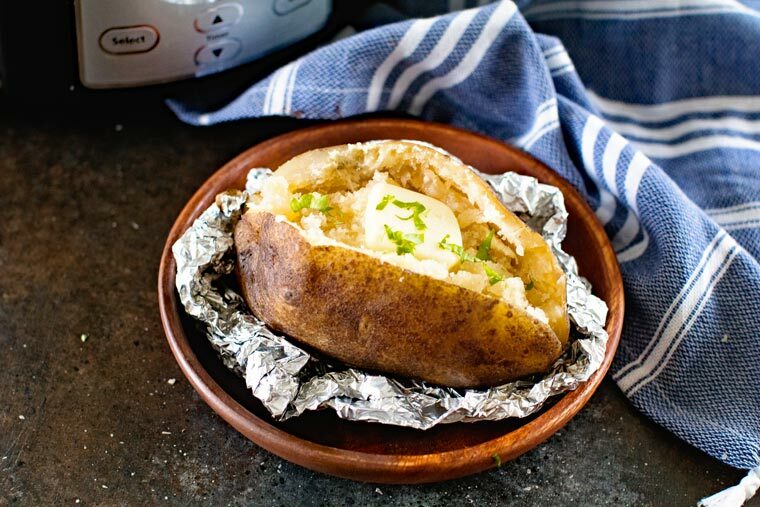 Quick and easy crock pot baked potatoes are even better than baked potatoes made in your oven! You can get baked potatoes without the oven heating up your house and come home to baked potatoes ready for dinner! Did you know you can make baked potatoes in the crock pot? I think I knew this, but I had never tried it before until last week. Mind blown. Crock Pot Baked Potatoes are my new favorite thing! I love that I can pop them in during the day and they do their thing without me having to be around. 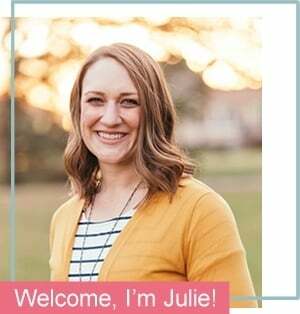 This perfect for you working parents. I always wanted baked potatoes during the week – I mean I love a great Hasselback Potato or baked potato but they take a while to make! 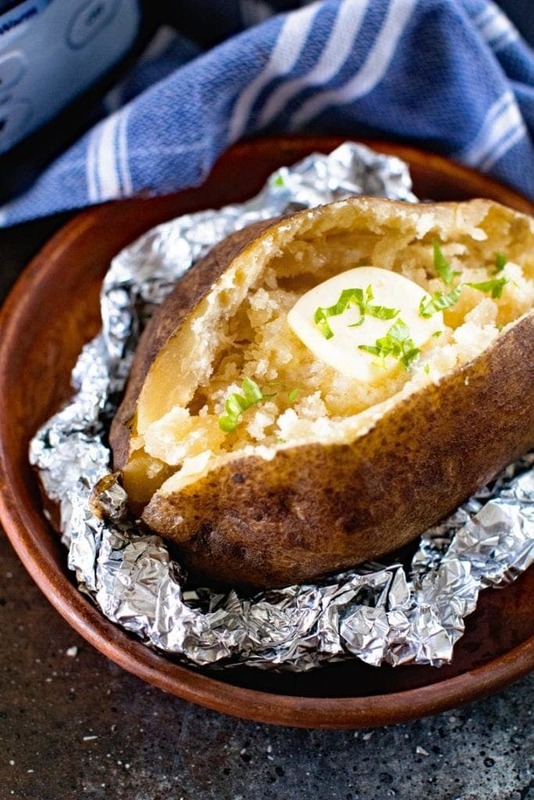 Make baked potatoes in your slow cooker! No more waiting around when time is limited during the weeknight. I say “when time is limited” but really, when isn’t time limited during the week? Also, for those of you that tend to stash your crock pot away for the summer don’t do that. It’s the perfect tool for cooking your meals during the summer without heating up your kitchen. 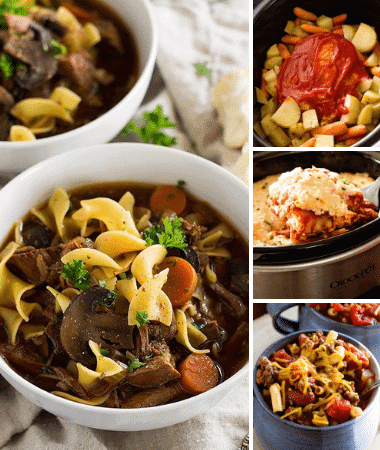 I think the crock pot has become our forgotten friend not only during the summer months, but since it’s new faster sister came onto the market, the Instant Pot. I’m going back to my roots and pulling the crock pot out because I love how handy it is to this day. I’m going to be making these baked potatoes in that handy crock pot a lot too because apparently Miss K loves baked potatoes. Seriously. Who would have thought? 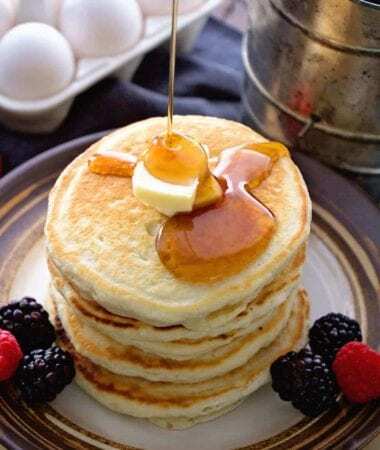 I was making these and I’m like I’m doubting the fact that my children will touch these, but we will test it out. When I unwrapped them from the foil Miss K’s entire face lit up. Mom I LOOOOOOVE those. I raised my eyebrows thinking I’ll believe it when I see you eat those. She had me slice it in half and then put butter on it. She then picked up a half of it and eat it, skin on and everything. So, what do I do? Make them again. They are currently in my slow cooker not even a week later because she’s been begging for them again. I made a different potato last night and her whole face fell when she realized it wasn’t these Crock Pot Baked Potatoes so I’m trying to redeem myself and make them tonight! I love serving up homemade barbecues with them. I skip the bun and pile it on my potato with a little sour cream and cheese. The BEST! Also, question for you, do you want my barbecue recipe? It’s literally so easy I don’t know if I can it a recipe. All I do is add ketchup, mustard, brown sugar and vinegar to hamburger. It’s the barbecue I grew up on! You have no excuse not to make these crock pot baked potatoes because they only have five ingredients! Take 10 minutes in the morning and then you come home to perfect baked potatoes after work. 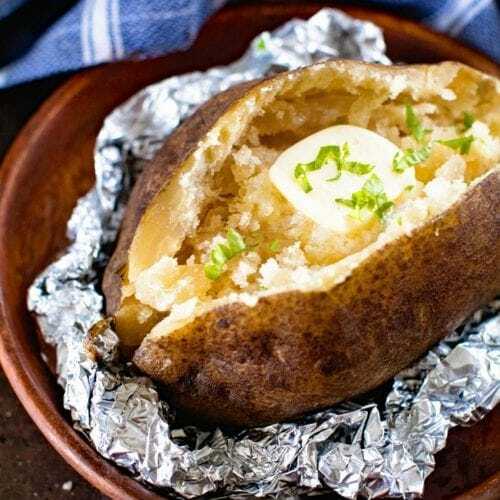 Like I said multiple times in the post these slow cooker baked potatoes are so easy you have no excuse not to make them! First thing you do is give the potatoes a good scrub, prick with a fork multiple times and dry them. Tear off 4 sheet of tinfoil to wrap the potatoes in. You want them to be about 12” x 12” squares. In a small dish combine the salt, garlic powder and pepper. 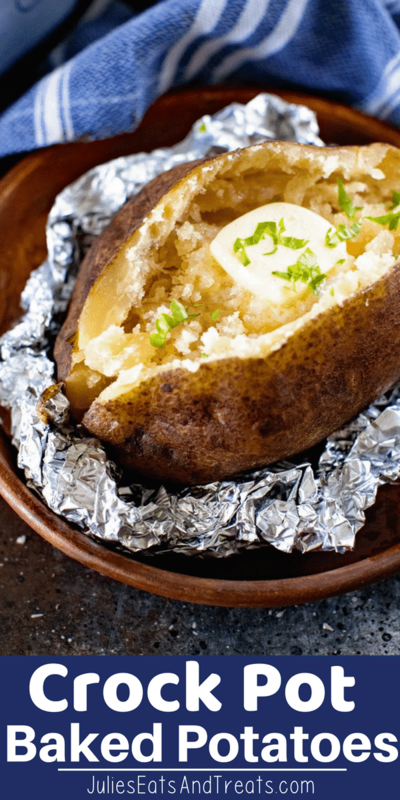 Brush the potatoes with olive oil, sprinkle on the seasoning and then wrap them in the tin foil. Place the baked potatoes on the bottom of the crock pot and cook on low for 7 1/2 – 8 hours or high 4 1/2 – 5 hours. Wash potatoes, prick with fork multiple times and dry them. Set aside. Tear 4 sheets of foil squares, 12x12 inch, to fold around the potatoes. Take one potato and brush the entire potato with olive oil. Sprinkle with a 1/4 of the seasonings. Spread over entire potato. Wrap in a piece of foil. Place in crock pot. Repeat until all potatoes are in crock pot. 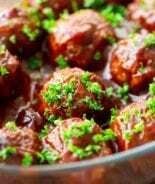 Turn crock pot to low and cook 7 1/2 - 8 hours or 4 1/2 - 5 hours or until potatoes are tender. The cooking time will vary based on the size of your potato. Large potatoes will need longer, while smaller potatoes will cook more quickly. Do not overcook your potatoes are they will become mushy. 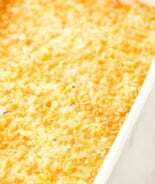 Carefully remove foil, split open and serve with butter, bacon, cheese, Greek yogurt, chives etc. Great idea for the crock pot! Great idea, and recipe but I would recommend omitting the foil wrap!!! Not everyone is aware of the danger posed when potatoes are stored in that foil wrapping! 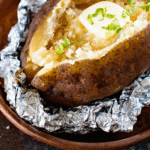 Never, ever store foil wrapped baked potatoes!!! 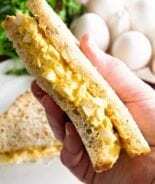 Botulism can occur and is deadly!!! 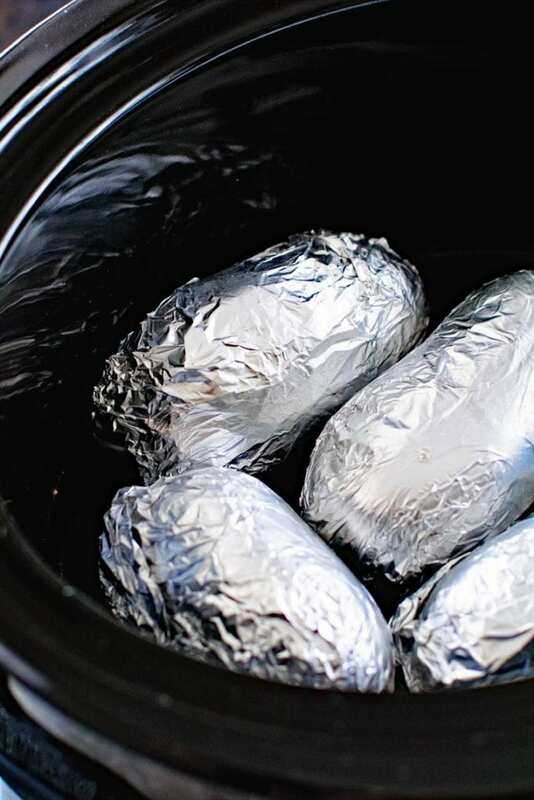 Can you do this in the crockpot without the foil? I’ve never tested it but I’ve seen others do it that way! Yes you are correct. 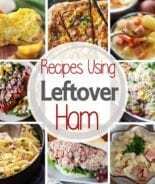 You should not store these if they are leftover is tinfoil. I actually prefer baked potatoes made this way!! My mind was blown the first time I made them in the crockpot too!! Me too and my oldest daughter LOVES them! Do we need any liquid to cook the potatoes in the crock pot? Water , broth, milk, etc ? How did I not know about this? Such a great idea! Do they have to be single layer on the bottom of crock pot? Or can you fill up the crockpot for a group of people? I’m sorry! If you click on the meal planning sheets image now you should receive the pop up to get the sheets! 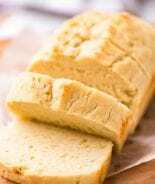 Don’t have sea salt can I use kosher salt or table salt? Yes that will work fine! How long would you cook 2 large potatoes? It should be the same time. It just might take a little longer.